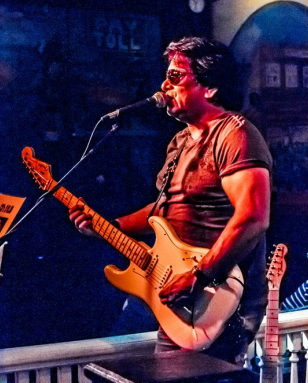 Rex Lyons is the respected guitar player, vocalist and band leader of The Fabulous Ripcords. Also guitarist of the much loved he sits in regularly with Los Blancos, Pete McMahon, and other local luminaries around CNY. Rex’s style is equal parts country, blues, rockabilly, and swing. Rex is best known for his work with Whiteboy and the Wagonburners which rose to local and national acclaim. Rex has also played with The Mudd Kats and The Insurgence. Irv Lyons - Guitar, vocals & songwriter. 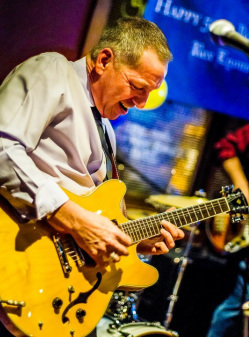 Irv Lyons Jr. is a talented vocalist and guitar player with a distinctive sound rooted in latin influenced jazz and straight ahead country and blues. Irv is a major contributor of original material for the band including straight ahead blues, instrumentals, latin, and roots rockers. He loves it when you ask him how he plays the guitar left handed and upside down. He says it came that way. Scott Ebner - Keys, accordion, mandolin, guitar and songwriting. Scott Ebner is known for his barrelhouse piano playing and swirling Leslie speaker sound along with accordion, mandolin, guitar and songwriting. Scott’s playing is influenced by New Orleans, Nashville, Little Richard, Jerry Lee Lewis, Bill Payne, The Band, and Chicago blues. Scott has played at the Bottom Line in NYC, The Broken Spoke in Austin, and other venues with CNY native and current Austin favorite Penny Jo Pullus as a member of the “Vanishing Breed”. He has appeared at the Hillbilly Lane showcases in Austin Texas during the SXSW Festival and with Penny Jo at the festival. In the past, Scott has played and recorded with Kim Lembo, The Casual Dogs, The Z-Bones, Ron Spencer and Jumpstart, Penny Jo Pullus’s Trailer Trash, and Ron DeRollo. 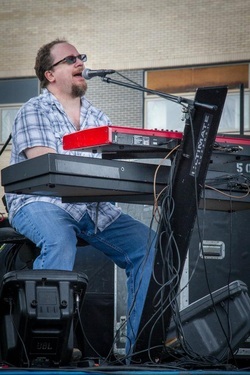 He currently operates Skunk City Studio and is responsible for recording and mixing The Tipphilllbillies releases, “Recipe” (nominated for a SAMMY) and "Lucky", The Roustabouts “Fried Chicken To Go”, and the first release from The Fabulous Ripcords, which won a Syracuse Area Music Award for Best Americana release. Jay Gould is a first call bass player who is an integral part of the Ripcords and an accomplished jazz guitar player. Jay hails from CNY but lived and played in Boston before returning to CNY. His work with The Roustabouts, Ron Spencer and Jumpstart, and Beyond The Pale in Boston show his deep dedication to roots and american music and skill at arranging. David Read is the heartbeat of the Ripcords. A flawless meter and a distinctive drumming style punctuated by subtle finesse. David delivers a controlled intensity that keeps the Ripcords in perfect time and tempo. He has played with The Works (Sammy Hall of Fame inductee's), The Late Show, Public Eye w/ Mark Doyle and Joe Whiting, The East Shore All Stars, The Viceroys, Reckless Drivin' and Smokin' and with the Maruders Drum Corp.
David also taught drum lessons at the Music Center for ten years and still teaches privately. A left who plays righty… David started playing piano at age five and started guitar and bass at thirteen. Eventually he settled on drums in his mid teens.